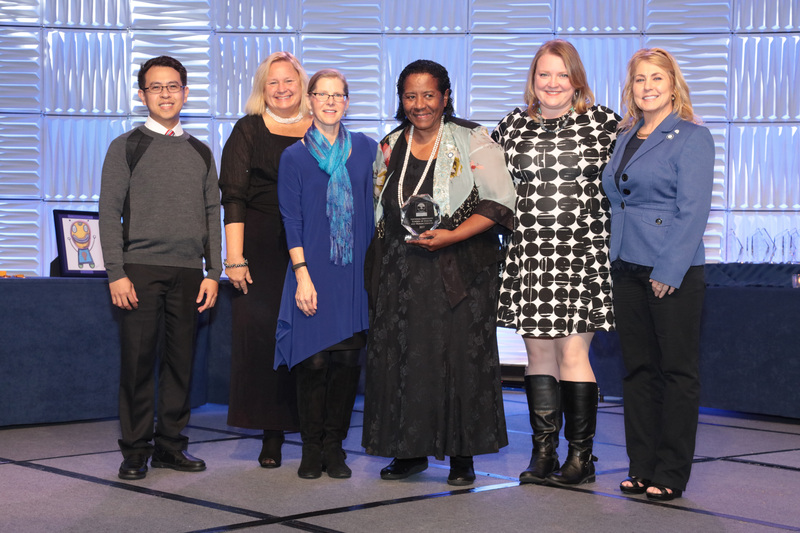 Dr. Gloria McNeal, Dean of the School of Health and Human Services (center) at National University, accepted the Planetree Silver Recognition on behalf of the School during the Planetree International Conference on Patient-Centered Care in Baltimore, Maryland. Derby, Conn./San Diego, Calif. – Planetree International announced today that the National University School of Health and Human Services, based in San Diego, California, has been awarded Planetree Silver Recognition for Significant Advancement in Person-Centered Care. As the first academic institution in the world to achieve Planetree Recognition, the private, nonprofit National University will be positioned to train a new generation of healthcare providers in principles aimed at advancing the highest standards of person-centered healthcare. Planetree is a global leader in establishing and advancing person-centered health care approaches through partnerships with 700 healthcare organizations in 23 countries. Person-centered healthcare prioritizes the active participation of patients and their families throughout the healthcare process with an emphasis on partnership, compassion, transparency, inclusion, and quality. In the case of National University, which offers programs both in person and online, the Planetree Silver Recognition affirms the commitment of the School of Health and Human Services to meet similar standards within the academic setting. “We are pleased to welcome National University’s School of Health and Human Services as the first academic institution that has achieved Planetree Recognition, and we look forward to witnessing how the School’s team builds on this achievement to take its commitment to delivering student-centered education on the concepts of person-centered care to even greater heights,” said Susan Frampton, President of Planetree International. The Dean of National University’s School of Health and Human Services, Dr. Gloria McNeal, thanked Planetree for its role in the year-long, all-inclusive process. “This Recognition affirms the commitment of our School of Health and Human Services to continue adapting to the most current and relevant needs in healthcare on behalf of our students, preparing them to take on leadership roles that will shape the future of healthcare, ensuring better patient and healthcare outcomes,” said Dr. McNeal. Dr. McNeal said the Recognition sets the foundation for the National University School of Health and Human Services to further align person-centered principles throughout its range of programs which includes nursing, public health, healthcare administration, informatics, integrative health, allied health, clinical lab science, radiation therapy, clinical affairs, and health data analytics. Person-centered care is becoming an area of increasing focus in health fields since hospitals and health care facilities are being measured according to outcomes that are linked to these approaches. In California alone, there are 12 hospitals and healthcare facilities that are Planetree member sites, of which five have achieved Planetree Recognition, including in the San Diego region Sharp Chula Vista Medical Center, Sharp Coronado Hospital and Sharp Memorial Hospital. Planetree International, which has worked with numerous healthcare organizations across the country and globally for nearly four decades, is considered the gold standard for setting standards and assessment of person-centered care. The Planetree Silver Award is an extension of Planetree’s established Person-Centered Designation Program®, the only program to recognize excellence in person-centered care across the continuum of care in countries around the world. Health care organizations awarded Person-Centered Designation® undergo a rigorous process to demonstrate comprehensive implementation and maintenance of person-centered care, as captured in more than 50 specific criteria. In healthcare facility settings, the criteria include a shared medical record policy, nonrestrictive visiting practices, opportunities for patient and family input into health center operations, recognition of the role of spirituality and the arts in healing, and a physical environment that facilitates privacy, promotes open communication between patients and providers, and is accommodating of family members’ involvement in their loved one’s care. Recognizing that ultimately the patient experience originates with those providing care, several criteria focus on nurturing a work environment that is supportive of staff. What distinguishes Planetree Recognition among other health care quality awards is the way in which key stakeholders themselves have a voice in assessing the organization’s person-centeredness. Silver Recognition was awarded to National University’s School of Health and Human Services following a series of focus groups with students, staff, and faculty, which attested to culture that genuinely emphasizes person-centered care. Planetree International is a mission based not-for-profit organization that has partnered with over 700 healthcare organizations around the world and across the care continuum to transform how care is delivered. Powered by over 50,000 focus group attendees comprised of patients, families, and staff, and nearly 40 years of experience working with healthcare organizations, the Planetree approach emphasizes the quality of human interactions that occur within healthcare settings, the importance of connecting healthcare personnel to the purpose and meaning of their work, and practical strategies for engaging patients and family members as true partners in care. These elements have been consolidated into the Planetree Person-Centered Designation Program, which provides organizations with a structured process to guide culture change efforts that yield improvements in clinical and operational outcomes. Drawing on this experience, in 2017 Planetree partnered with the National Academy of Medicine to introduce an evidence-based Guiding Framework for Patient and Family Engaged Care.